Assam HSLC Routine 2018 or SEBA HSLC Exam Routine 2018 Programme of AHM Download from Secondary Education Board Assam website in pdf format. Assam HSLC Routine 2018 or SEBA HSLC / AHM Exam Programme (10th Class) notification for final Exam is out now. Download it from Secondary Education Board Assam website in pdf format. 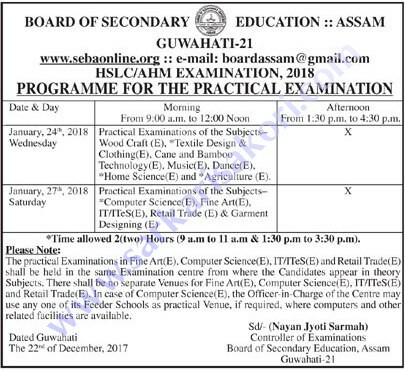 The Board of Secondary Education Assam has recently uploaded the HSLC/AHM Exam Routine 2018. So all Students who are going to seat their HSLC Exam 2018 can be Download Assam HSLC Exam Routine 2018 PDF format through below-provided table or link. The Assam HSLC/AHM Examination will start from 16 February to 8 March 2018 and the Assam Board 10th Practical Examination will be held on 22nd & 24th January 2018.
a) Ten minutes extra-time is allowed from 8.50 a.m. to 9.00 a.m. in the Morning Shift and 1.20 p.m. to 1.30 p.m. in the Afternoon shift to reading and Question Paper only. The Officers-in charge will arrange distribution of question papers accordingly. b) Modern Indian Languages (MIL): Assamese, Bengali, Hindi, Bodo, Manipuri, Nepali, Khasi, Garo, Mizo, Hmar and Urdu. There will be separate Question Papers for the subjects – Assamese, Bengali, Hindi & Urdu MIL for High Madrassa candidates having 50 marks and time duration 2 (two) hours. c) Elective Languages (Time 3 hours) and In-Lieu Languages (Time 2 hours): There will be common question paper with Groups A and B for each language viz. – Assamese(E), Bengali(E), Hindi(E), Bodo(E), Manipuri(E) and Santali(E) irrespective of Elective or Lieu Language. d) Candidates offering Elective subject will have to appear in both the groups A & B while In Lieu Language the candidates will have to appear in Group A only, which will be treated as Assamese(IL), Bengal(IL), Hindi(IL), Bodo(IL), Manipuri(IL), and Santali(IL) respectively. e) The Practical Examinations will be held on 24th & 27th, January 2018. *Time allowed 2(two) Hours (9 a.m to 11a.m & 1:30 p.m to 3:30 p.m). The practical Examinations in Fine Art(E), Computer Science(E), IT/lTeS(E) and Retail Trade(E) shall be held in the same Examination center from where the Candidates appear in theory Subjects. There shall be no separate Venues for Fine Art(E), Computer Science(E), IT/ITeS(E) and Retail Trade(E). In case of Computer Science(E), the Officer-in-Charge of the Centre may use any one of its Feeder Schools as practical Venue, if required, where computers and other related facilities are available. HSLC Routine 2018 Download in PDF (Theory & Practical) and JPEG (Theory & Practical) format. You will be interested more in Assam HSLC Routine 2018 & Latest Assam Govt Jobs Alert 2017.